Jio has crossed the milestone of 100 million customers in 170 days and here comes another greet for every Jio customer out there. All of you are currently enjoying the free benefits from Jio Happy New Year offer but since it has a validity of up to end of March so after that they have provided another great offer named Jio Prime with reasonably lower cost on comparison to other network operators. 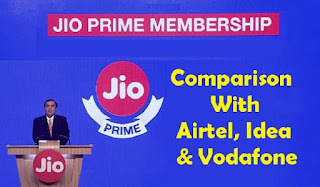 This post is all about comparison between Jio Prime Membership offer versus other operators like Airtel, Idea and Vodafone at the same price range. We will compare the benefits you will get at the same price for being a Jio customer or being another telecom operator’s customer. But before that let us recall and wrap up some of the major highlights of Reliance Jio Prime offer details. This membership offer is valid for every existing customer and the one who grabs Jio SIM on or before end of March. If you have Jio SIM then all you need to do is subscribe to Jio prime membership plan worth Rs. 99 for a year. Subscription must be done between 1st March to 31st March and then you will be eligible to activate the Jio premium offers every month at a reasonable cost of Rs. 303 for every month until one year. 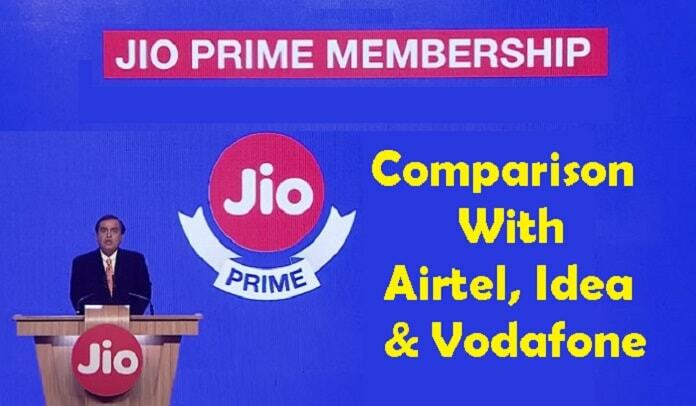 So many of you are confused about “who are Jio prime members” and “what is Jio prime membership” then here we are elaborating each and every aspect clearly. Jio Prime Membership is two stage process. As announced, you can subscribe to Jio prime membership from 1st March to 31st March. Both existing customers and the one who grabs Jio SIM on or before 31st March can subscribe to prime membership for 99 Rs and you will become Jio prime members. You can recharge your Jio SIM directly from MyJio application by paying online through various mediums like Debit or Credit card, Net Banking & Jio Money. So Jio New Plan will cover all offers you are currently enjoying in Jio happy new year offer like 1 GB of 4G Internet data every day with 100 SMS daily, Jio premium apps, unlimited free video and voice calling for Local, STD and Roaming. So technically you are giving Rs. 10 daily for these offers i.e. Rs. 303 for 30 days. SMS / Day 100 N.A. N.A. N.A. Well the comparison is slightly up and down with respect to pricing but you can take this as a fact that Reliance Jio wins the situation for each and every aspects like amount of data per month, unlimited free calling, free sms and access to jio premium apps.